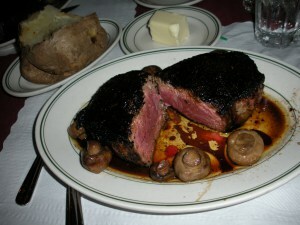 If you’re looking for the perfect steak, the Five O’Clock Steakhouse in Milwaukee has exactly what you are looking for. The steaks of the Five O’Clock have risen to fame both locally and nationally. The Five O’Clock has been featured in books, the Travel Channel, Rachel Ray, and various local media outlets due to the supper club’s mouth-watering and perfectly cooked steaks. But, the perfect steak needs the perfect sides and starters for a well-rounded meal. Have no fear, because the Five O’Clock has you covered. The Five O’Clock offers some fantastic starts and sides for your dinner experience. Choose the steak that speaks to you most, and then browse the side like the famous sautéed mushrooms, asparagus, rice pilaf, or try the French fried beer battered onion rings. Looking for an appetizer while your steaks are being prepared? The Five O’Clock has a lengthy list that includes shrimp cocktail, shrimp scampi; crab stuffed mushroom caps, or the savory baked French onion soup, complete with melted gruyere. There are many more options available for your sides and starters waiting for you at the famous Five O’Clock Steakhouse.